The main aim of this review is to update the reader with practical knowledge concerning the relationship between diabetes mellitus and periodontal diseases. Exclusive data is available on the association between these two chronic diseases till date. Articles published on this relationship often provide the knowledge of definitions of diabetes mellitus and periodontal diseases, prevalence, extent, severity of periodontal disease, complications of diabetes along with the possible underlying mechanisms. The authors reviewed human epidemiological studies, cross-sectional observations and longitudinal cohort, case control that evaluated variables exclusively over the past 30 years and the predominant findings from the "certain" articles are summarized in this review. This review clarifies certain queries such as 1) Do periodontal diseases have an effect on the metabolic control of diabetes? 2) Does diabetes act as a risk factor of periodontitis? 3) What are the possible underlying mechanisms relating the connection between these two chronic diseases? 4) What is the effect of periodontal intervention on metabolic control of diabetes? After a thorough survey of literature, it was observed that diabetes acts as a risk factor in development of periodontitis as periodontitis is significantly aggravated in patients suffering from diabetes having long term hyperglycemia. Different mechanisms underlying the association between the accelerated periodontal disease and diabetes are emerging but still more work is required. Major efforts are required to elucidate the impact of periodontal diseases on diabetes. At the same time, patients are needed to be made aware of regular periodontal maintenance schedule and oral hygiene. Diabetes and periodontal disease are quantifying their association significantly in public health importance. The biological association between the two chronic diseases is extensively studied. The present review identified the research reports published on the relationship between diabetes and chronic periodontitis, since 1980. Periodontitis is much more than a localized oral infection. The interrelationship between the periodontitis and diabetes suggests the predisposition of systemic disease to oral infection and vice versa. In order to understand the cellular/molecular mechanisms responsible for such a cyclical association, common changes associated with diabetes and periodontitis that produce a synergy when the conditions coexist are being studied. Diabetic patients with periodontal disease may have increased risk of diabetic complications. In a separate analysis including over 600 subjects periodontal disease is suggested as a significant risk factor for myocardial infarction and stroke as well as diabetes. The patients with severe periodontitis have 2.3 times high death rate from ischemic heart disease as compared to rate in subjects with no or mild periodontitis. In the subjects with severe periodontitis, the death rate from diabetic nephropathy was 8.5 times higher subjects with no or mild periodontitis. The overall mortality rate from cardio renal disease was 3.5-fold higher in subjects with severe periodontitis, suggesting that the presence of periodontal disease poses a risk for cardiovascular and renal mortality. Other studies demonstrated that those patients with type 1 diabetes with periodontitis had a higher prevalence of ketoacidosis, retinopathy and neuropathy. A case controlled study at baseline reported that diabetic patients with severe periodontitis have a greater prevalence of proteinuria, stroke, transient ischemic attack, attack, angina, myocardial infarction, and heart failure than in diabetic patients with mild periodontitis. These findings strongly suggest that with increasing diabetes-related complications, periodontal patients are more likely to develop additional long-term complications. Being a chronic infection, treatment of periodontal disease generally differs from treatment for acute infections. Treatment attempts to reduce the number of pathogens and produce a periodontium that is conducive for health. Mechanical therapy remains the treatment of the choice. Traditional therapy includes the non-surgical treatment of scaling and root planning. Mechanical therapy is generally used to disrupt the bio-film thereby reducing virulence of pathogens and allowing the host to re-establish the periodontal health. Adjunctive antibiotics are being used wherever necessary but are used only after mechanical disruption of the bio-film. Control of chronic infections and modulation of the host response offer a new therapeutic approach in the management of patients with both diabetes mellitus. Different investigations have provided the evidences that treatment for periodontitis in type 2 diabetic patients resulted in an improvement in glycemic control. Periodontal patients with diabetes mellitus receiving mechanical therapy, has shown marked reduction in glycosylated hemoglobin as compared to control group in the study using glycosylated hemoglobin as glycemic index. In a separate study in which 113 native Americans were provided ultrasonic scaling with systemic doxycycline, or irrigation with water, chlorhexidine, or povidone-iodine. The doxycycline-treated groups showed significantly great reduction in glycated hemoglobin, probing depth and subgingival microbial infection. Two way action of doxycycline, a modified tetracycline has been demonstrated; (i) its antimicrobial action and (ii) its ability to modify the host response. In another separate investigation, treatment group receiving full mouth scaling and root planning manifested statistically significant improvement in plaque index, gingival index, probing pocket depth, clinical attachment levels and bleeding on probing depth, and glycated hemoglobin as compared to the control group of patients without any periodontal therapy. One of the studies reported a 28 percent reduction in preterm low birth weight births in patients receiving scaling, root planing and a chlorhexidine mouth rinse or metronidazole when compared to that in the control group without treatment. D'Auito points out that insulin demand in type I diabetic patients decreases after periodontal treatment including scraping, radicular smoothing, curettage, local gingivectomies and selective extractions, scaling, and root planning in addition to the use of antibiotics such as penicillin and streptomycin. Hence, all these findings point towards the same direction: periodontal treatment in metabolically controlled type 2 diabetic patients resulted in a significant improvement in diabetic status and severity of its complications. Despite the generalized accepted fact that treatment of periodontal disease in diabetic patients may reduce the insulin requirements and improve the metabolic balance. However, till date no one has evaluated the effects of periodontal therapy on the metabolic state of the poorly-controlled diabetic patients. Periodontal disease and diabetes are strongly interrelated and have common pathobiology. Inflammatory events during periodontal disease may play an important role in development of diabetes and insulin resistance probably facilitates the progress of periodontal disease. Diabetes acts as a risk factor in development of periodontitis as periodontitis is significantly aggravated in patients suffering from diabetes having long term hyperglycemia. Different mechanisms underlying the association between the accelerated periodontal disease and diabetes are emerging but still more work is needed. Major efforts are required to elucidate the impact of periodontal diseases on diabetes. At the same time, patients are needed to be made aware of regular periodontal maintenance schedule and oral hygiene. 1. Wild S, Roglic G, Green A, Sicree R, King H. Estimates for the year 2000 and projections for 2030. Diabetes Care 2004;27:1047-53. 2. Pucher J, Stewart J. Periodontal disease and diabetes mellitus. Curr Diab Rep 2004;4:46-50. 3. Joshi SR, Parikh RM. India-Diabetes capital of the world: Now heading towards hypertension. J Assoc Physicians India 2007;55:323-4. 4. Sadijot SM, Nigam A, Das S, Bajaj S, Zargar AH, Prasannakumar KM, et al. The burden of diabetes and impaired glucose tolerance in India using the WHO 1999 criteria: Prevalence of diabetes in India study (PODIS). Diabetes Res Clin Pract 2004;66:301-7. 5. American Diabetes Association. Diagnosis and classification of diabetes mellitus. Diabetes Care 2004;27:Suppl.1, S5-S10 . 6. Albander JM, Brunelle JA, Kingman A. Destructive periodontal disease in adults 30years of age and older in United States. J Periodontol 1999;70:13-29. 7. Papapanou PN. World workshop in clinical periodontics. Periodontal diseases: Epidemiology. Ann Periodontol 1996;1:1-36. 8. Tervonen T, Knuuttila M. Relation of diabetes control to periodontal pocketing and alveolar bone level. Oral Surg Oral Med Oral Pathol 1986;61:346-9. 9. Tsai C, Hayes C, Taylor GW. Glycemic control of type 2 diabetes and severe periodontal disease in US adult population. Community Dent Oral Epidemiol 2002;30:182-92. 10. Taylor GW. Severe periodontitis and risk for poor glycemic control in patients with non-insulin dependent diabetes mellitus. J Periodontol 1996;67:1085-93. 11. Moore PA, Weyant RJ, Mongelluzzo MB, Myers DE, Rossie K, Guggenheimer J, et al. Type 1 diabetes mellitus and oral health: Assessment of tooth loss and edentulism. J Public Health Dent 1998;58:135-42. 12. Salvi GE, Yalda B, Collins JG, Jones BH, Smith FW, Arnold RR, et al. Inflammatory mediator response as a potential risk marker for periodontal diseases in insulin dependent diabetes mellitus patients. J Periodontol 1997;88:127-35. 13. Cianciola LJ, Park BH, Bruck E, Mosovich L, Genco RJ. Prevalence of periodontal disease in insulin dependent diabetes mellitus (juvenile diabetes). J Am Dent Assoc 1982;104:653-60. 14. Unal T, Firatli E, Sivas A, Meric H, Oz H. Fructosamine as a possible monitoring parameter in non insulin dependent diabetes mellitus patients with periodontal disease. J Periodontol 1993;64:191-4. 15. Firatli E. The relation between clinical periodontal status and insulin dependent diabetes mellitus. J Periodontol 1997;68:136-40. 16. Chen I. The surgeon General's report on oral health: Implications for research and education. N Y State Dent J 2000;66:38-42. 17. Skrepcinski FB, Niendorff WJ. Periodontal disease in American Indians and Alaska Natives. J Public Health Dent 2000;60:261-6. 18. Taylor G. Bidirectional interrelationship between diabetes and periodontal diseases: An epidemiologic perspective. Ann Periodontol 2001;6:99-112. 19. Kawamura M, Fukunda S, Kawabata K, Iwamoto Y. Comparison of health behaviour and oral/ medical conditions in non-insulin-dependent (type 2) diabetics and non-diabetics. Aust Dent J 1998;43:315-20. 20. Collin HL, Uusitupa M, Niskaken L, Kontturi Narhi V, Markkanen H, Koivisto AM, et al. Perioodntal findings in elderly patients with non-insulin dependent diabetes mellitus. J Periodontol 1998;69:962-6. 21. Soskolne WA. Epidemiological and clinical aspects of periodontal disease in diabetics. Ann Periodontol 1998;3:3-12. 22. Bacic M, Plancak D, Granic M. CPTIN-assessment of periodontal disease in diabetic patients. J Periodontol 1988;59:816-22. 23. Schlosman M, Knowler WC, Pettitt DJ, Genco RJ. Type 2 diabetes mellitus and periodontal disease. J Am Dent Assoc 1990;121:532-6. 24. Sznajder N, Carranaro J, Rugna S, Sereday M. Perioodontal findings in diabetic and non diabetic patients. J Periodontol 1978;49:445-8. 25. Saremi A, Nelson RG, Tulloch-Reid M, Hanson RL, Sievers ML, Taylor GW, et al. Periodontal disease and mortality in type 2 diabetes. Diabetes Care 2005;28:27-32. 26. Rosenthal I, Abrams H, Kopczyck A. The relationship of inflammatory periodontal disease to diabetic status in insulin-dependent diabetes mellitus patients. J Clin Periodontol 1988;15:425-9. 27. Thorstensson H, Kuylenstierna J, Hugoson A. Medical status and complications in relation to periodontal disease in insulin dependent diabetics. J Clin Periodotol 1996;23:194-202. 28. Tervonen T, Karjalainen K, Knuuttila M, Huumonen S. Alveolar bone loss in type 1 diabetic subjects. J Clin Periodontol 2000;27:567-71. 29. Taylor GW, Burt BA, Becker MP, Genco RJ, Shlossman M, Knowler WC, et al. Non-insulin dependent diabetes mellitus and alveolar bone loss progression over 2 years. J Periodontol 1998;69:76-83. 30. Christgau M, Palitzsch KD, Schmalz G, Kreiner U, Frenzel S. Healing response to non-surgical periodontal therapy in patients with diabetes mellitus: Clinical, microbiological and immunologic results. J Clin Periodontol 1998;25:112-24. 31. Stewart JE, Wager KA, Friedlander AH, Zadeh HH. The effect of periodontal treatment on glycemic control in patients with type 2 diabetes mellitus. J Clin Periodontol 2001;28:306-10. 32. Westfelt E, Rylander H, Blohme G, Jonasson P, Lindhe J. The effect of periodontal therapy in diabetics. Results after 5 years. J Clin Periodontol 1996;23:92-100. 33. Gusberti F, Syed S, Bacon G, Grossman N, Loesche W. Puberty gingivitis in insulin dependent diabetic children, part I: Cross sectional observations. J Periodontol 1983;54:714-20. 34. Gislen G, Nilsson KO, Matsson L. Gingival inflammation in diabetic children related to degree of metabolic control. Acta Odontol Scand 1980;38:241-6. 35. Karjalainen K, Tervonen T, Kuksa T. Collagen glycosylation in palatal mucosa in type I diabetic patients and in healthy controls. J Dent Res 1996;75:215. 36. Pontes Andersen CC, Flyvbjerg A, Buschard K, Holmstrup P. Relationship between periodontitis and diabetes: Lessons from rodent studies. J Periodontol 2007;78:1264-75. 37. Loe H. Periodontal disease: The sixth complication of diabetes mellitus. Diabetes Care 1993;16:329-34. 38. Zambon JJ. Periodontal diseases: Microbial factors. Ann Periodontol 1996;1:879-925. 39. Haffajee AD, Socransky SS. Microbial etiologic agents of destructive periodontal diseases. Periodontol 2000 1994;5:78-111. 40. Socransky SS, Haffajee AD, Cugini MA. Microbial complexes in subgingival plaque. J Clin Periodotol 1998;25:134-44. 41. 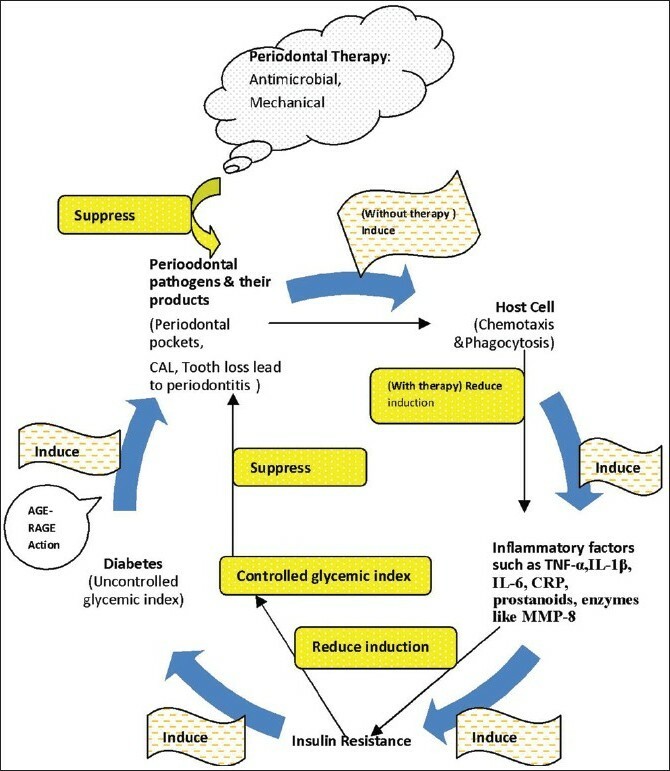 Page R, Schroeder H. Pathogenesis of inflammatory periodontal disease: A summary of current work. Lab Invest 1976;34:235-49. 42. Mashimo P. Subgingival microflora in insulin depedent diabetes mellitus (juvenile diabetes). J Dent Res 1981;60:459-62. 43. Mandell RL, Dirienzo J, Kent R, Joshipura K, Haber J. Microbiology of healthy and diseased periodontal sites in poorly controlled insulin-dependent diabetics. J Periodontol 1992;63:274-9. 44. Southerland JH, Taylor GW, Moss K, Beck JD, Offenbacher S. Commonality in chronic inflammatory diseases: Periodontitis, diabetes, and coronary artery disease. Periodontol 2000 2006;40:130-43. 45. Nishimura F, Iwamoto Y, Soga Y. The periodontal host response with diabetes. Periodontol 2000 2007;43:245-53. 46. Sastrowijoto SH, van der Velden U, van Steenbergen TJ, Hillemans P, Hart AA, de Graaff J, et al. Improved metabolic control, clinical periodontal status and subgingival microbiology in insulin-dependent diabetes mellitus. A prospective study. J Clin Periodontol 1990;17:233-42. 47. Holt SC, Bramanti TE. Factors in virulence expression and their role in periodontal disease pathogenesis. Crit Rev Oral Biol Med 1991;2:177-281. 48. Hausmann E, Raiz LG, Miller WA. Endotoxin stimulation of bone resorption in tissue culture. Science 1970;168:862-4. 49. Bosnjak A, Plancak D, Curilovic Z. Advances in relationship between periodontitis and systemic diseases. Acta Stomat Croat] 2001;(35),2:67-71. 50. Stashenko P, Fujiyoshi P, Obernesser MS, Prostak L, Haffajee AD, Socransky SS. Levels of interleukin-1 beta in tissue from sites of active periodontal disease. J Clin Periodontol 1991;18:548-54. 51. Brownlee M. Lilly Lecture 1993. Glycation and diabetic complications. Diabetes 1994;43:836-41. 52. Schmidt AM, Hori O, Cao R, Yan SD, Brett J, Wautier JL, et al. RAGE: A novel cellular receptor for advanced glycation end products. Diabetes 1996;45:S77-80. 53. Ramasamy R, Vanucci SJ, Yan SS, Herold K, Yan SF, Schmidt AM. Advanced glycation end products and RAGE: A common thread in aging, diabetes, neuro-degeneration, and inflammation. Glycobiology 2005;15:16R-28R. 54. Vlassara H. Non-enzymatic glycosylation. Diabetes Annu 1991;6:371-89. 55. Schmidt AM, Weidman E, Lalla E, Yan SD, Hori O, Cao R, et al. Advanced end products (AGEs) induce oxidant stress in the gingival: A potential mechanism underlying accelerated periodontal disease associated with diabetes. J Periodontal Res 1996;31:508-15. 56. Baeuerle PA. The inducible transcription activator NF-kappa B: Regulation by distinct protein subunits. Biochim Biophys Acta 1991;1072:63-80. 57. Schreck R, Rieber P, Baeurele PA. Reactive oxygen intermediates as apparently widely used messengers in the activation of the NF-kappa B transcription factor and HIV-1. EMBO J 1991;10:2247-58. 58. Moughal NA, Adonogianaki E, Thornhill MH, Kinane DF. Endothelial cell leukocyte adhesion molecule -1 (ELAM-1) and intercellular adhesion molecule-1 (ICAM-1) expression in gingival tissue during health and experimentally-induced gingivitis. J Perioodntal Res 1992;27:623-30. 59. Collins T. Endothelial nuclear factor-kappa B and the initiation of atherosclerotic lesion. Lab Invest 1993;68:499-508. 60. Schmidt AM, Hasu M, Popov D, Zhang JH, Chen J, Yan SD, et al. Receptor for advanced glycation end products (AGEs) has a central role in vessel wall interactions and gene activation in response to circulating AGE proteins. Proc Natl Acad Sci U S A 1994;91:8807-11. 61. Takahashi K, Takashiba S, Nagai A, Takigawa M, Myoukai F, Kurihara H, et al. Assessment of interleukin-6 in the pathogenesis of periodontal disease. J Periodontol 1994;65:147-53. 62. Yan SD, Schmidt AM, Anderson GM, Zhang J, Brett J, Zou YS, et al. Enhanced cellular oxidant stress by the interaction of advanced glycation end products with their receptors/ binding proteins. J Biol Chem 1994;269:9889-97. 63. Lalla E, Lamster IB, Feit M, Huang L, Spessot A, Qu W, et al. Blockade of RAGE suppresses periodontitis-associated bone loss in diabetic mice. J Clin Invest 2000;105:1117-24. 64. Ryan ME, Carnu O, Kamer A. The influence on the periodontal tissues. J Am Dent Assoc 2003;134:34S-40S. 65. Bagdade J, Nielson K, Bulger R. Reversible abnormalities in phagocytic function in poorly controlled diabetic patients. Am J Med Sci 1972;263:451-6. 66. Manouchehr-Pour M, Spagnnuolo P, Rodman H, Bissada N. Comparison of neutrophil chemotactic responses in diabetic patients with severe periodontal disease. J Dent Res 1981;60:729-30. 67. Mealey BL, Ocampo GL. Diabetes mellitus and periodontal disease. Periodontol 2000 2007;44:127-53. 68. Seppala B, Sorsa T, Ainamo J. Morphometric analysis of cellular and vascular changes in gingival connective tissue in long term insulin-dependent diabetes. J Periodontol 1997;68:1237-45. 69. Grossi SG, Skrepcinski FB, DeCaro T, Robertson DC, Ho AW, Dunford RG, et al. Treatment of periodontal disease in diabetics reduces glycated hemoglobin. J Periodontol 1997;68:713-9. 70. Mine K, Nejat A, Elif U, Faik Murat E. The effect of improved periodontal health on metabolic control in type 2 diabetes mellitus. J Clin Periodontol 2005;32:266-72. 71. Mitchell-Lewis D, Engebretson SP, Chen J, Lamster IB, Papapanou PN. Periodontal infections and pre-term birth: Early findings from a cohort of young minority women in New York. Eur J Oral Sci 2001;109:34-9. 72. D'Aiuto F, Parker M, Andreou G. Periodontitis and systemic inflammation: Control of the local infection is associated with a reduction in serum inflammatory markers. J Dent Res 2004;83:156-60. 73. Tervonen T, Knuuttila M, Pohjamo L, Nurkkala H. Immediate response to non-surgical periodontal treatment in subjects with diabetes mellitus. J Clin Periodontol 1991;18:65-8. 74. Ternoven T, Karjalainen K. Periodontal disease related to diabetic status. A pilot study of the response to periodontal therapy in type 1 diabetes. J Clin Periodontol 1997;24:505-10.